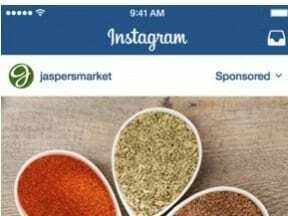 Are you advertising in an expensive market? Is the cost per click for a top term too expensive? 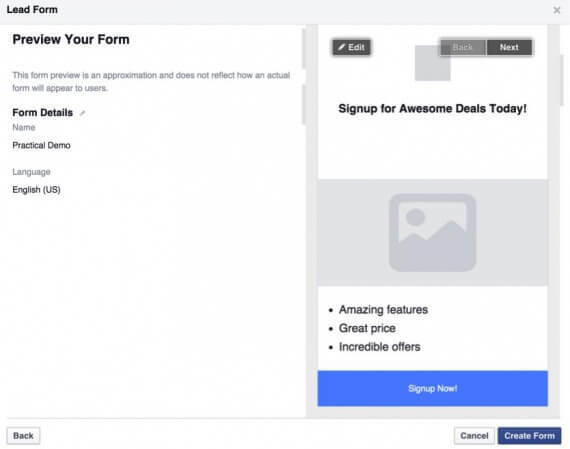 If you rely on leads for your business, there is a solution: Facebook Lead Ads. You’ll pay less for a click, and you’ll provide the customer with a better experience and interaction with your brand. 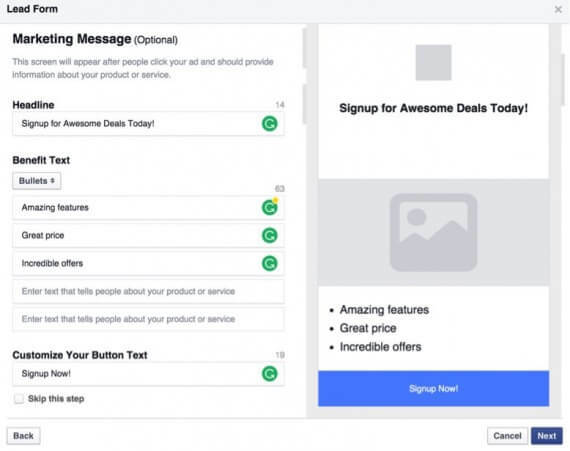 Lead Ads is one of the newest ad products to roll out of the Facebook. 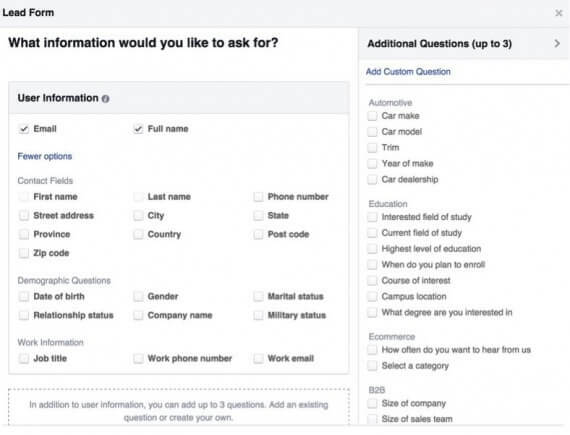 Using Lead Ads, you create a form, which can ask for contact information like a phone number or email, or the car they drive, or even custom questions, like the color of their favorite pants. The entire experience takes place on Facebook, within the ad. And since you can bid per lead, the notion of paying for non-converting clicks is over. The cost for Lead Ads will depend on your industry. I’ve spoken to many advertisers who say the costs are, on average, much lower than they expected. Here’s an example. Say a tech meet-up is trying to build its membership base. The meet-up runs into a common problem for tech companies using paid search advertising: Keywords are extremely expensive, with big players competing on them. Clicks can cost $10 each — a $50 budget is gone in five clicks. That $10 is just a click, nothing else — no lead, nothing. 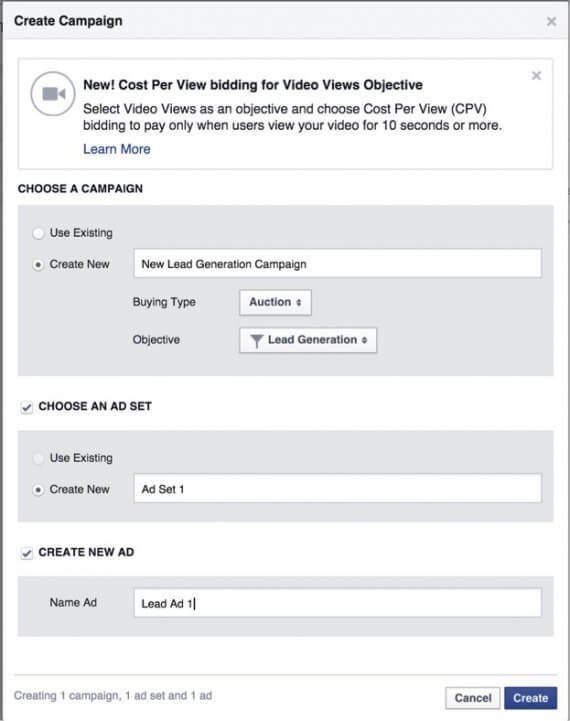 Using Facebook’s Lead Ads, the average lead cost from a lookalike audience of people who have signed up in the past is $6, almost half the cost of paid search. So what’s the catch with Lead Ads? It depends on what you’re trying to accomplish. The first big catch is that you’re limited on the number of questions you can ask. The second catch is that Lead Ads is mobile-only — if you prefer to advertise on desktop, or that’s where most of your users are, you won’t be able to take advantage of it. A caveat about mobile, however, is that Lead Ads work entirely within Facebook. 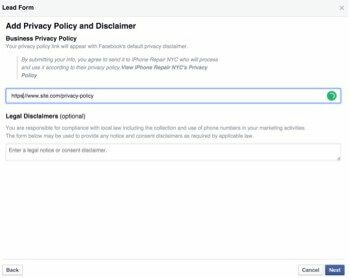 It doesn’t matter whether your site is mobile – users never leave Facebook with this ad unit. Let’s walk through how to make a Lead Ad. 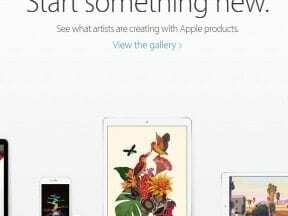 I’ll assume that you have a fully set up ads account, as well as a complete website. 1. Open Power Editor. 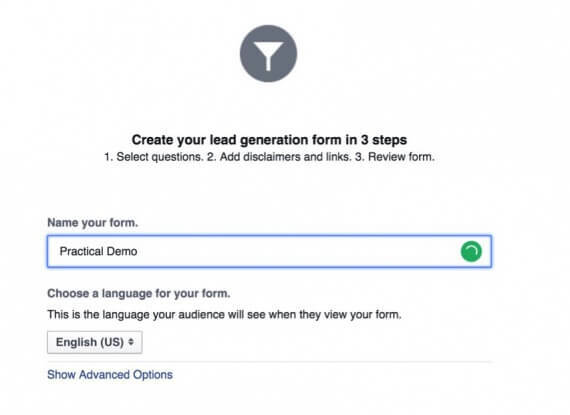 This is the only place, currently, where you can create the lead forms and apply them to an ad. 2. Create a new campaign, choosing the objective of “Lead Generation.” You can also create a new ad set and ad here, as well. 3. Link the ad set with a page, and then accept the terms. 4. 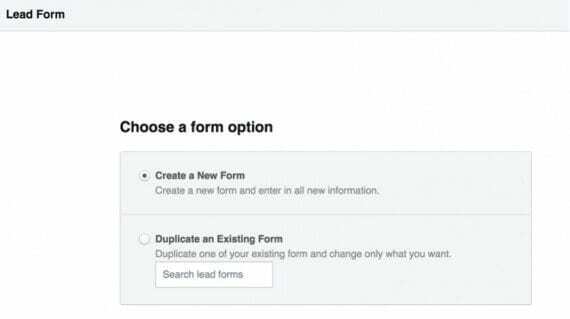 Navigate to the ad, and you’ll see a red box around “Lead Form.” Click “Create New Form” to get started. 7. Choose “Add Marketing Message.” I’ll address this a bit later. 9. Here are the options. When adding questions, there are many different options. 10. 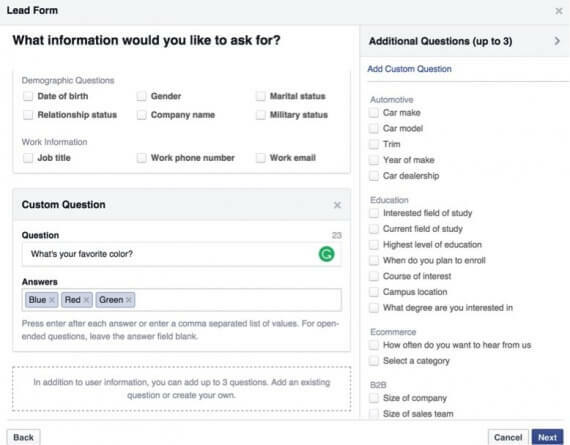 Let’s keep it simple and just add a custom question by clicking on “Add Custom Question” in the upper left. Let’s ask their favorite color, and give them the choices or Red, Blue, and Green. At “Add Custom Question” in the upper left, we’ll ask favorite color, and give them the choices or Red, Blue, and Green. 12. Click Next and enter the link a user can choose to go to after she completes your form. 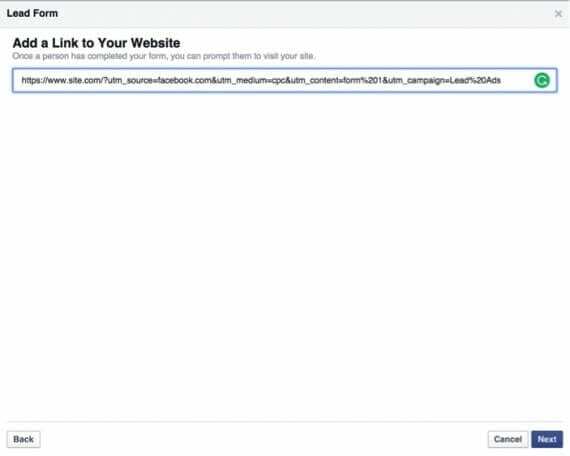 Make sure you add UTM tagging parameters. Enter the link a user can choose to go to after she completes your form. 13. After you click Next, you’ll be able to design the form. It’s easy to do. For this example, I added a few calls-to-action and a quick description. Design the form is straightforward. 14. Once you click Next, you’ll be able to preview your form and create it. You can preview your form and then create it. 15. After you’ve created your form, create your ad. Now you are set to publish it. After you’ve created your form, create an ad. You are set to publish it. As for the bidding and budgets, use a budget your comfortable with spending each day, but I’d do automatic bids first. Once they run for a few days, you’ll be able to see what the average price is, and then decide if you want to do manual bidding or not. 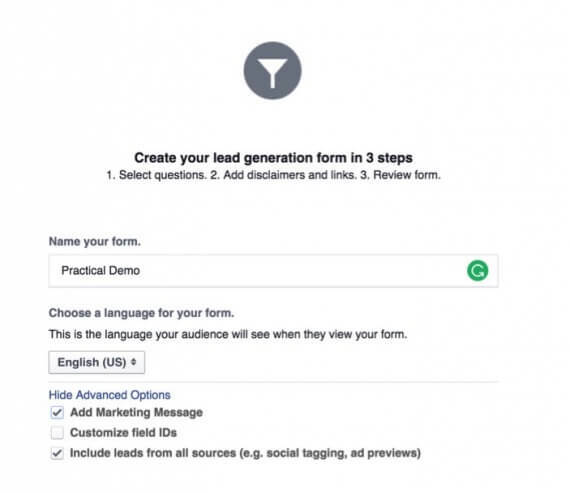 Finally, to access your leads, visit the “Publishing Tools” tab while you’re on the Facebook page of the account connected to your ads, and then select “Lead Ads Forms.” They’ll be provided in a CSV format. And that’s the Lead Ads product. It can help obtain highly qualified leads at a low cost. If you are you using Lead Ads please share your results, below.